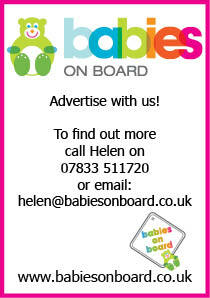 Babies on board is THE local guide for pregnancy, babies and toddlers in Watford, Hemel Hempstead, Berkhamsted and Tring! Babies on board magazine comes out every three months, delivering a shower of information for all expectant parents, new parents and those already enjoying the ride! Among our local parents, everyone knows somebody who has had a little one needing special care in the Neonatal Unit or the Special Care Baby Unit at Watford General Hospital. That is why the Neonatal Unit at Watford General is our chosen charity at Babies on board, and this Autumn our generous team have donated some marvellous gifts for our Silent Auction. Please, please, please bid for these items as gifts for yourself or for others, and help us raise money for our charity. In the autumn issue we have some brilliant articles, written by our team of writers qualified in their field – remember that you can contact them if you have any questions, or you can email me and I will pass your questions on.